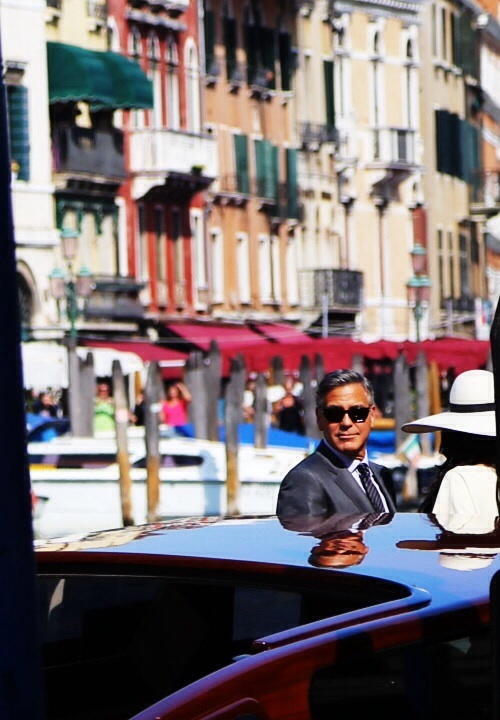 Somehow, my invite to the wedding(s) of George Clooney and Amal Alamuddin got lost in the mail. Luckily, I didn’t let a little thing like that stop me from showing up. As it turned out, I was too hungovbusy to attend the Saturday event, an informal ceremony followed by a hohum party featuring Clooney chums Matt Damon, Bono and others. 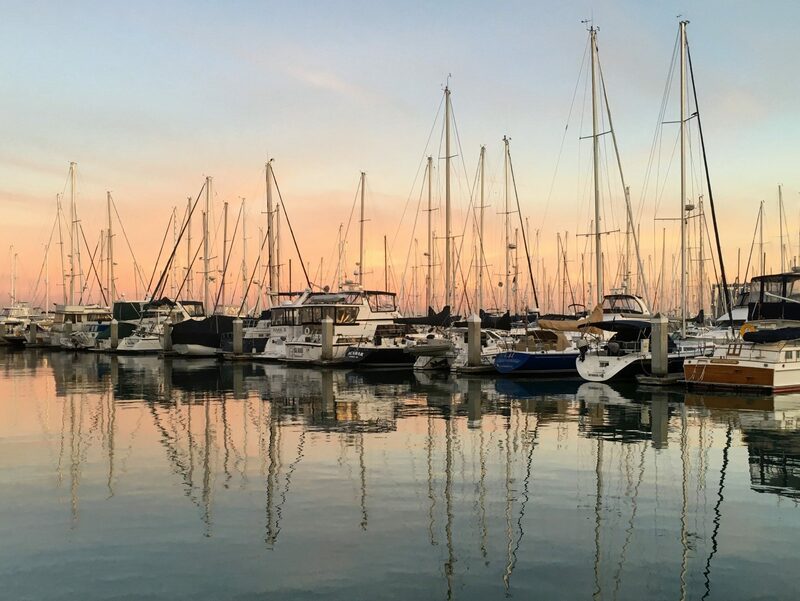 But Monday morning, when they popped into Venice City Hall to seal the deal with an official ceremony, I was ready to go. 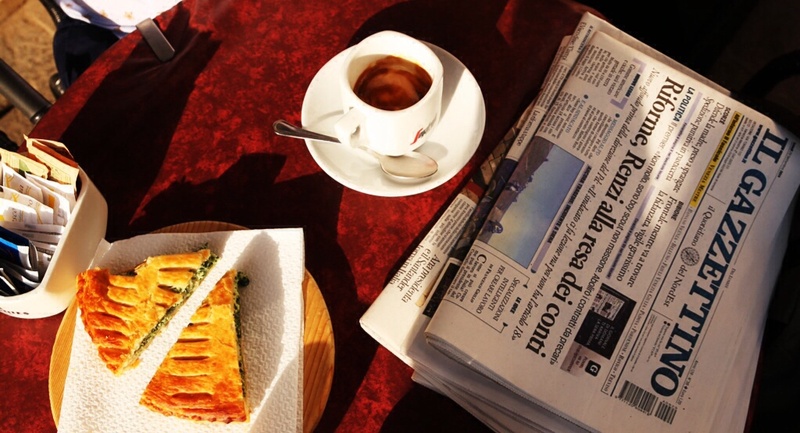 I started the day the proper Italian way with a coffee and a pastry. Yes, it was a caffe Americano, what can I say, I do not get the concept of espresso, but the rest of it was pretty darned authentic. Then it was time to stake out the best spot. Fortunately for me, I was with a hardworking member of the international media, so I had only to follow her. And follow her I did, up and down the steps of the Rialto Bridge and through a labyrinth of twisting passage to one side of the Grand Canal, back up and down the steps of the Rialto Bridge and through a labyrinth, etc., to the other side of the Grand Canal, up the stairs of the Rialto Bridge, etc., etc., because it turned out the first spot was better after all. Then followed two and a half hours of waiting enlivened by the emergence from the pre-renaissance City Hall of wedding parties that did not include a Hollywood star. This attractive couple from Austria sailed off in a gondola toasting themselves and the crowd with sparkling wine. I did not envy them the gondola but I did covet the bubbles. I was standing next to a nice lady from Holland named Ilse and a professional photographer I affectionately nicknamed Bluto. But not out loud. He was rocking a curly beard, a man bun and not so much a six-pack as the full keg. So clearly not a fellow to trifle with. When G&A came out of the mayor’s office all hitched up George obligingly stood in the front of his private launch and waved to the excited crowds lining the banks of the canal. I’m telling you, that guy can do old-style Hollywood glamour like nobody’s business. I extended the lens of my trusty Canon as far as it would go, leaned out over the water and clicked away for dear life. I got a lot of the backs of peoples’ heads, some weird shots of the sky and this one shot at the top of the post that is a little out of focus but, I won’t lie, is the most exciting picture I have ever taken. 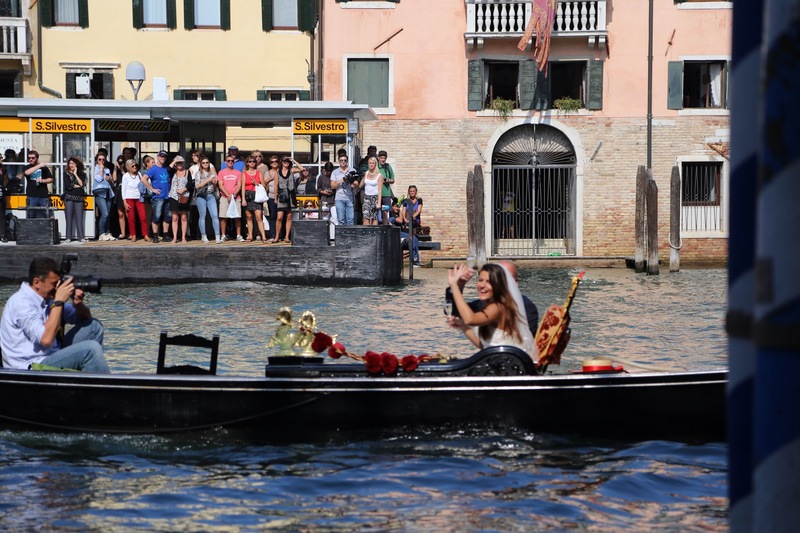 Then the newlyweds zoomed off to the airport in their gleaming craft called the “Amore” — of course — followed by a flotilla of police and paparazzi. By early afternoon it was all over at City Hall. 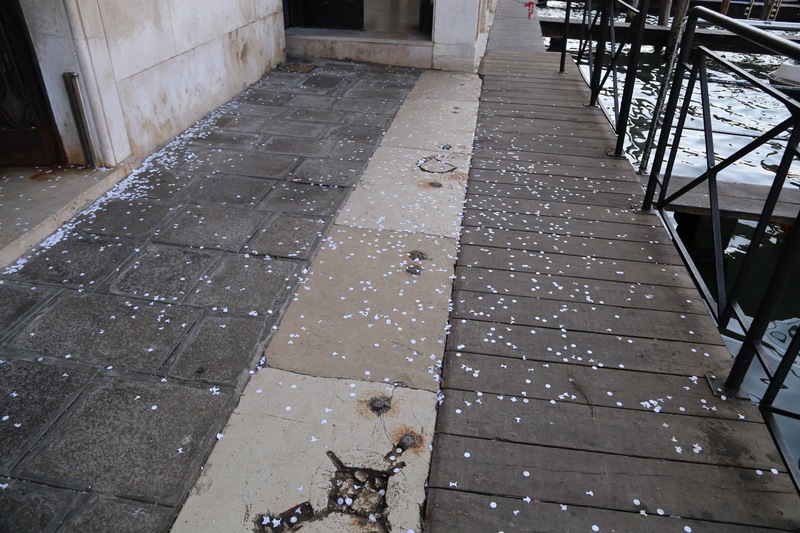 The crowds, the boats, the excitement — all gone and nothing left to mark the event of the day save for a faint dusting of confetti on the worn paving stones of La Serenissima.